Articulate Quizmaker's Size and Position window lets you control an object’s height, width, rotation, scale, crop, and location. 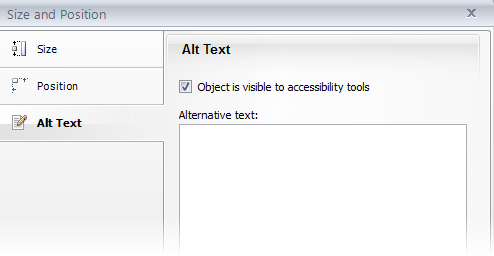 It's also where you enter alternative text (often called alt text) for objects. Alt text is important for learners with visual impairments who rely on screen readers. 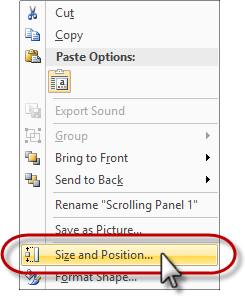 Select an object, go to the Format tab, and click the arrow in the lower right corner of the Size group. 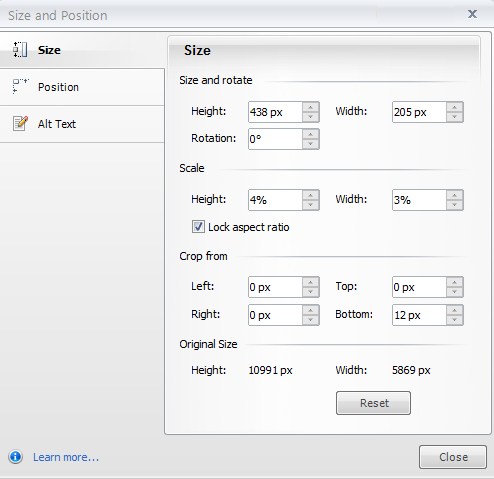 Right-click an object, and chose Size and Position. Select an object, and press Ctrl+Shift+Enter. When the Size and Position window appears, click the tabs along the left edge to set your options. Reset: Click this button to reset the object to its original size. This option is only available for pictures, screenshots, characters, videos, and Flash files. Although it's easy to move an object on your slide by dragging it, sometimes you might want more control over its exact position. The Position tab lets you specify exactly where the object should appear. Use the Horizontal and Vertical fields to enter a pixel value, and then use the From selectors to indicate the relative location. The Alt Text tab is where you set accessibility options that affect screen readers and keyboard navigation. Object is visible to accessibility tools: This box is marked, by default, for all objects in your quiz. Uncheck it if you'd prefer that the selected object not be detected by screen readers and keyboard navigation. For example, if you have objects on the slide that don't contribute to the content's meaning, such as aesthetic elements (rectangles, lines, etc. ), it's a good idea to uncheck this box for those objects. Alternative text: If you'd like screen readers to use a name or description that's different from what appears in Quizmaker's timeline, enter that alternate text here.